Professor David Phoenix, London South Bank University’s (LSBU) Vice-Chancellor, is set to receive the prestigious China Friendship Award for his commitment and outstanding contributions to the country's economic and social progress spanning over 15 years. With only 50 awarded globally each year, The Friendship Awards are known to be the highest honour for achievement by a non-Chinese citizen. Prof. Phoenix, who is a visiting professor at Sichuan University, has been recognised for his contributions to science, enterprise and higher education, and will receive his award at a ceremony involving the Chinese Premier. “It’s a great honour to be presented with this award, and I want to take the opportunity to thank the wonderful teams that have supported me here and in China over the last 15 years. 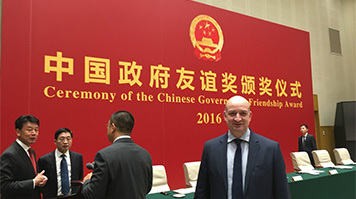 “China is a significant partner for the UK in terms of both business and education. I’ve been very fortunate to have had the opportunity to build on those partnerships through collaboration with a range of organisations in China, and through the establishment of a research and innovation centre there in recent years. “Feedback from LSBU students who have benefitted from study tours in China continues to show how such partnerships can equip our graduates for a globally competitive workplace. Find out more about studying at London South Bank University.